This isn’t your average mini-golf course. There is something special about this room and it took almost 50 years to come up with this design. Maybe if A and B are point-sized this is true. 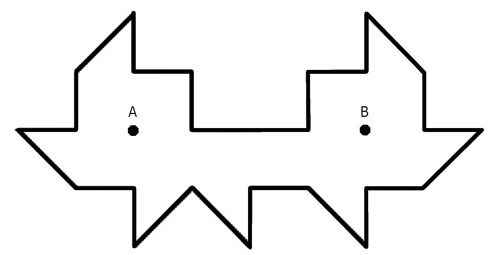 If A and B are golf ball sized then just hit A off the corner that is down and to the right. Corners let you bounce is many directions based on where you hit. One bounce brings you to B. The candle reflection example is more interesting. I’m not sure about the com between a forever bouncing golf ball & candle light is correct. The light will dissipate after a number of reflections. The light wouldn’t dissipate if you’re assuming perfect reflections (no absorption or transmission). The lit match would continually pump the entire room (or a 2D slice of it depending on the floor and ceiling) with more and more photons except for at that one spot.